I have been much taken with the approach of Phil Smith (alias Crab Man) in the recently published ‘Counter Tourism: a handbook‘. I am brave enough to admit to a little academic jealousy here, as it is a book I rather wish I had written, as I have a habit of looking at sites the ‘wrong way’, or from angles that shouldn’t normally interest the visitor. I can always be found taking pictures of the interpretation panels, closely looking at the uniforms worn by site stewards, and undertaking a mental archaeological excavation of the visible remnants of interpretation and visitor management schemes. I am hoping to work the latter into something slightly more formal, as the modern archaeology of visitor management leaves a very tangible reminder of how sites continue to have dynamic lives after becoming supposedly static heritage sites. Smith approaches the visit to heritage sites in a creative response / reaction mode, against the management of visitors by site managers, which in many cases for operational management purposes are expected to conform within the relevant authorised heritage discourse (cf. Laurajane Smith writing in ‘The Uses of Heritage‘). Organisations such as the National Trust are making great efforts to allow and encourage multiple engagements and interpretations of the site for the complex audiences which it attracts, but this pushes Smith towards further subversion via his counter-tourism approach. This has gained some traction via the website and facebook page. 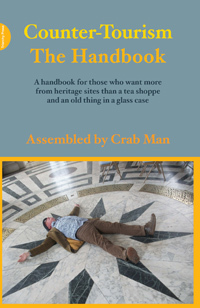 An interesting and thoughtful exploration of the relationship between the advocates of the Crab Man approach and ‘managers’ of sites comes at the end of the handbook, and is great way into thinking about the interplay between site operational management and site interpretation and presentation. Other artistic responses to sites can be seen to have similarities – the works of Slinkachu which was displayed at Belsay Hall in the Extraordinary Measures show a couple of years ago come to mind.